Ok, ok, this is all just a thinly-veiled excuse to play with the new Themes feature, see what it takes to create a custom theme with Visio 2007, and share some of that info with all y’all. Clearly, the mid-life crisis is approaching and my longing for the glory days of computing strengthens with each passing sunset. 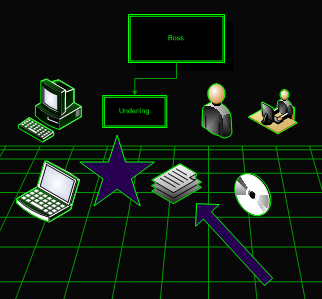 If you’ve read: “Laser” Shape, then you will start to see a pattern–a searing, green-on-black, “vector-graphics” pattern. So I created the Battle Zone Theme template for Visio 2007. This one will be great for that Tuesday-morning status meeting. Use this in your PowerPoint presentations and you’ll be sure to delight your 30-50 year-old co-workers. But stay away from the printer with this one! Regardless of whether you like Battle Zone or not (Over Thirty-somethings Unite!) Visio Themes are cool because they save you time. You don’t have to individually select a bunch of shapes and change their line, fill or text attributes to get a different look. 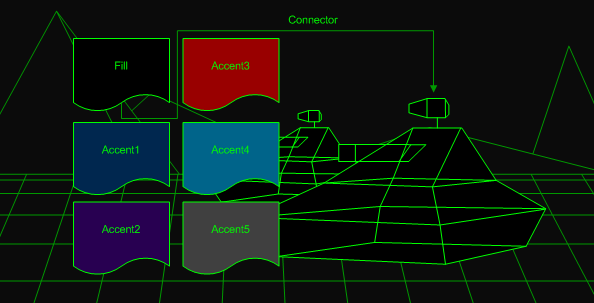 Shapes that are correctly built for Themes will automatically pick-up the theme that you have chosen. You don’t have to do anything, formatting-wise! 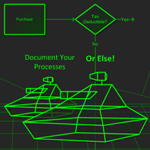 Here’s some of Visio 2007’s built-in shapes, “As-Dropped” into a document with the Battle Zone theme. They look pretty good! First, make sure the Theme Task Pane is visible. You can do this via the Format > Theme menu, or click Theme button on the Formatting toolbar. 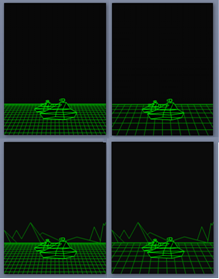 If you’ve been happily distracted by the mountains in the background and the perspective grid on the “ground”, then you’ll be happy to know that the template contains four backgrounds: Battle Zone 1, Battle Zone 2, Battle Zone 3 and Battle Zone 4. You can find Master shapes for these backgrounds in the local stencil, or Document Stencil. 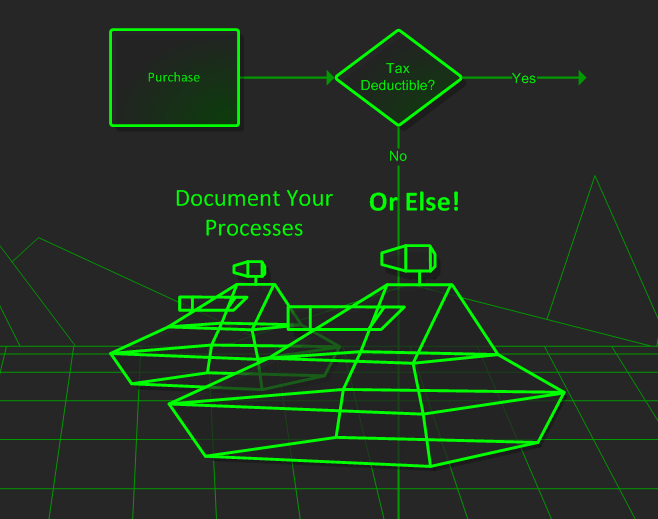 The Document Stencil is found via: File > Shapes > Show Document Stencil, if you don’t see it directly when the file is opened. To add a background to your diagram, just drop a background shape onto a foreground page, and Visio will automatically send it to the background. 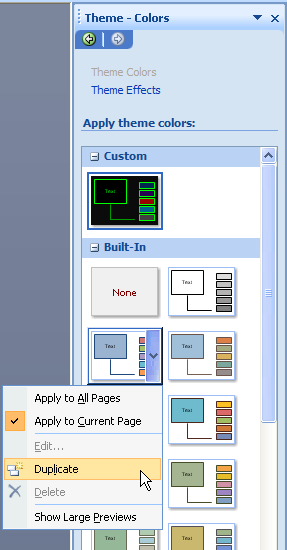 Visio will also replace any background that might have been there in the first place! You don’t have to mess with deleting anything or tabbing to the background page to make any changes. There doesn’t seem to be a really great way to deploy your custom themes, other than including them in custom Visio templates that you build and distribute. I.e. : you can’t centrally deploy them so that they are available to all templates that your users might already be using. The custom theme will transfer with the rectangle. You should see the custom theme in the Theme Pane when the new document is active. Themes are actually stored in the Document Stencil as a special type of master. Visio has been overloading the local-master mechanism for several versions now. Data Graphics, Themes, Custom Fills, Custom Line Patterns, and Custom Line Ends are all stored as Masters. If you are examining or editing a Visio document programmatically, you can distinguish between “normal” masters and “special” masters by examining the Master.Type property. We didn’t talk about Theme Effects in this article, but they are closely related to Theme Colors, and use a similar mechanism. The download has four files: two .vsd drawings and two .vst templates. There are 8.5 x 11 Letter size “US Unit” offerings, as well as A4 “Metric Unit” files for the NOT( USA ) crowd. Wow – I am totally blown away by this theme! 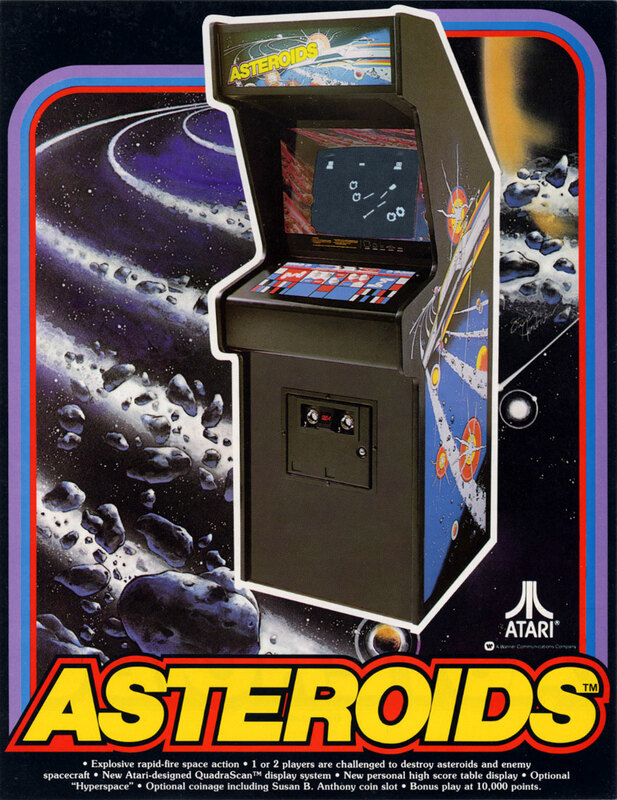 Truthfully – I wonder how many college educations I put into arcade machines in my teens? Me too. Thank God for Dad’s change jar, and that he pretended not to notice. It’s not that the theme is so gotta-have-it useful, but it was so easy to create! I am looking for a TANK SHAPE for use in VISIO. 2-D would work better for my purposes. Is there one available somewhere?